Seth Michaels married Michelle Campbell on April 13 at the Irvine Nature Center in Owings Mills, Md. Rachael Goren-Watts performed the ceremony, and Michael Rose served as master of ceremonies at the reception. Other Brandeisians in attendance included Paul Adler ’04, Judah Ariel ’04, Olive Barber, Shira Beckerman, Dev Bondarin, Ben Brandzel ’03, Molly Goren-Watts ’02, Aaron Kagan ’02, Joanna Nadler, Ari Rabin-Havt, Zach Sherwin ’02, Andrew Slack ’02 and Seth (Reibstein) Soulstein ’02. The couple lives in Washington, D.C. Adam Zimmerman has opened his own law practice (abzlaw.com) focusing on employment and labor law, with offices in Boston and Portland, Maine. Daniel ’02 and Aliza Saivetz Glasser welcomed daughter Abigail Rachel Glasser (Brandeis Class of 2035?) on March 20. Writes Aliza, “She joins her 3-year-old brother, Elliot, to complete our family of four.” Amanda (Moskowitz) Levin and Jesse Levin welcomed a baby girl into the world on Jan. 23. By eight weeks, Olivia was already sleeping through the night. “We are very lucky parents,” Amanda writes. Matt Riesenberg married Randi Phelps on May 18 in Seattle. Ed Hurwitz was a groomsman. Brandeis couples Lauren Haimovich Kupersmith and Adam Kupersmith ’99, and Betsy Plumb and Lyonel Jean-Pierre Jr. also attended, making it a great Brandeis mini-reunion. Jamie (Shapiro) Kleinman welcomed her third child, Lev, on Feb. 5. Her 4-year-old twins, Shayna and Shoshana, are really enjoying being big sisters. Diana Coben Einstein and her husband, Heath Einstein, welcomed a new baby boy, Asher Caleb, on Nov. 28, 2012. Big sisters Levyn, 5, and Adielle, 3, are so excited to have a baby brother. Diana is the associate program director at Temple Emanu-El in Dallas. John Yu is a youth ministry pastor at the Korean First Presbyterian Church in Greensboro, N.C. He and his wife, Meesun, along with their daughter, Jean, moved in December 2012 from Austin, Texas, to begin their new ministry. Anna Gray Beroll and her husband, David, had a son, Reuben Samuel Beroll, on Dec. 29, 2012. Sarah Chandler serves as the director of earth-based spiritual practice for Hazon’s Adamah Farm at the Isabella Freedman Jewish Retreat Center in western Massachusetts. In addition to co-leading the premier Jewish farming program, she teaches Jewish contemplative practices in nature and food-justice leadership. Josh Hill joined Alacra, which helps customers aggregate, filter and package critical business information, as vice president of marketing in February. In March, he published the “Marketing Rockstar’s Guide to Marketo,” a marketing automation e-book. Erin Daly is the marketing director at Everbridge, a Waltham, Mass.-based provider of emergency notifications systems. She is on the board of directors of the New England Direct Marketing Association and lives happily with her husband, daughter and two dogs. Samantha and Adam Zirkin had their third child and second boy, Ronen Samuel, on March 25. Rachael Goren-Watts and Molly Goren-Watts ’02 had a son, Jonah Elan, on Sept. 20, 2012. The family is doing well. They live in Amherst, Mass. 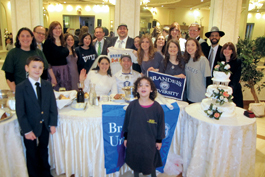 Jill Virag married Jonathan Abrami on Jan. 20 in Far Rockaway, N.Y. Attendees included Ayelet Weissmann; Jeremy Ginsburg ’00; Cheryl Turk Ginsburg; Shira Silton ’03; Jennifer Kanarek Cahn ’02; Elana Rosenfeld Ben-Tor ’99; Brenna Stein ’03, MA’04; Sherrie Neustein Orzel ’00; Diane Dubsky Mandel ’00; Leora Botnick ’00; Sally Schuss; and Adina Gluckman. IN FINE FEATHER: Classmates and friends were on hand to see Jill Virag ’01 marry Jonathan Abrami on Jan. 20. Foreground, from left: Dovid and Devora Ben-Tor. Middle row: Jill, Jonathan, Adina Gluckman ’01, Sally Schuss ’01 and Leora Botnick ’00. Back row: Ayelet Weissmann ’01; Jeremy Ginsburg ’00; Cheryl Turk Ginsburg ’01; Shira Silton ’03; Jennifer Kanarek Cahn ’02; Shmuel Cahn; Barak Ben-Tor; Elana Rosenfeld Ben-Tor ’99; Brenna Stein ’03, MA’04; Sherrie Neustein Orzel ’00; Yaakov Orzel; Moshe Mandel; and Diane Dubsky Mandel ’00. 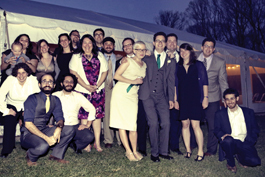 MARRIAGE OF TRUE MINDS: A host of alumni attended the marriage of Seth Michaels ’01 and Michelle Campbell on April 13. From left: Rachael Goren-Watts ’01, Molly Goren-Watts ’02, Seth (Reibstein) Soulstein ’02, Olive Barber ’01, Aaron Kagan ’02, Dev Bondarin ’01, Michael Rose ’01, Shira Beckerman ’01, Zach Sherwin ’02, Ben Brandzel ’03, Judah Ariel ’04, Michelle, Seth, Ari Rabin-Havt ’01, Joanna Nadler ’01, Andrew Slack ’02 and Paul Adler ’04.